It has long been a tradition that newly minted Tour champions and World Champions are invited to race at local events all over Europe. Many of these local races have very long histories and every year their goal is to show case the world’s best riders. It is these races that present very lucrative “appearance money” and, prior to today’s huge rider contracts, provided the stars of the sport with a major portion of their season’s earnings. 1967 was a year of extreme emotions for Britain’s cycling fans. In July Tom Simpson died in the stifling heat of Mont Ventoux on Stage 13 of the Tour de France. Barely two months later Beryl Burton claimed her second World Road Race Championship and Graham Webb won the men’s World Road Race Championship. I was living and racing in Ghent, Belgium that year. To us “baby boomers” that period was a very special time. The Beatles, the Stones, Cream, Hippies, free-love and a whole new post war generation was breaking free. But central to my life at that time was racing seriously. I had no support structure and race winnings dictated my ability to continue living the dream. In Ghent our most famous ‘locals’ were Tom Simpson, Barry Hoban and Vin Denson. These guys along with a few others had made it into the top teams of the day. 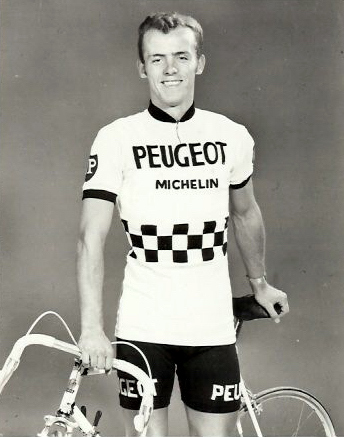 Tom had won some classics and in 1965 he became World Champion. But in July 1967 everything changed. Most people recalling that era remember where they were when Kennedy was assassinated. My overwhelming memory is of watching Tom’s demise on black and white TV in a Belgian shop. It was a Tour never to forget. 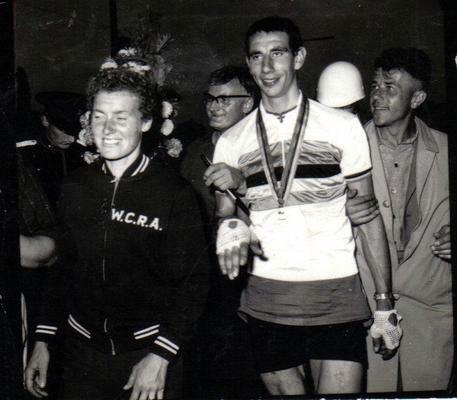 Especially for those of us racing in Belgium, July 1967 was a dark time. Many chose to pack up and go home, but I decided to stick it out. And then along came the World Championships. “Boom”, out of nowhere an Englishman wins the Amateur Road Race Championship. No sooner had Graham Webb won the title than 'fat Albert' Beaurick, the famous Belgian mentor of Tom Simpson, saw an opportunity to make money. So he rounded up a bunch of us English scruffs from the Ghent area and created a team around Webb. Off we went all over Europe as the British team to contest the so called ‘World's revenge races’. We raced our eyeballs out, feasted like pigs as special guests everywhere and naturally partied like mad at the post race celebrations. This was a classic case of the Andy Warhol 15 minutes of fame because I and the other lucky lads that landed this gig basked in the reflected glory of the Rainbow Jersey for several hectic and crazy weeks. Our nationality was the ticket to a few moments of fame. Now, ‘fat Albert’ loved to drink beer, eat and make money any way he could. We were easy pickings. So he appointed himself our agent and promptly set about organising a whirlwind tour of Europe. At that time race money came in three basic chunks. Expenses to travel and eat, start money and then actual race winnings. Albert got his hands on the first two chunks so we had to win something. Only the super rich flew back then. Trains and busses transported us. One such journey took us to the Grand Prix d’Espéraza which was located in the foothills of the Pyrenees south of Carcasonne. We left Ghent by train and headed for Paris where we changed trains and then journeyed overnight to Carcasonne. It is standard procedure in Europe to reserve your seat (for an extra fee) for longer journeys. Not till we got on the train did we discover that Albert had funded his week’s beer with our reservation fees. So we sat and slept in the corridor all night where people were endlessly clambering all over us to get to the restroom. When we finally crawled into Espéraza we discovered a classic old hill town with an ancient bridge spanning a broad mountain river. Tucked away in South West France between Carcasonne and the Spanish border, Espéraza is justly proud of it’s Grand Prix. The race has an illustrious heritage dating back to the first race run in 1935. Notable winners include Pierre Brambilla (the first rider to lose the TdF Yellow Jersey on the final stage) in 1943, Louison Bobet (first rider to win three successive TdF’s; 1953, 54, 55) in 1954 and Ireland’s first TdF Yellow Jersey wearer, Shay Elliott in 1965. Our 1967 edition of the Grand Prix d’Espéraza did not feature any TdF super stars but it did feature the reigning World Road Race Champion in Graham Webb (who was our team leader!). Naturally this unexpected bonus had us super motivated and along with this being my first ever trip to the mountains, I was ready to fly. The sight of bronzed and lean Spanish climbers made it even more exciting. Quite different from the chunky Belgians that we normally raced against. I remember little of the actual race but I know that we all did pretty well for Queen and country. It was the 10th September and we covered 150kms over mostly modest climbs. Ironically a Belgian (Joseph Schoeters) won the race, Serge Lapebie (nephew of 1937 Tour winner Roger Lapebie) was second and Graham Webb was third. After the race it was party time. The town shut down the old cobbled square, placed tables under the Plain trees and served up a huge feast for the world elite of pro/amateur cycling. Place of honor was reserved for the World Champion and his team. Apart from being grossed out by a huge platter of local wild fowl cooked with their heads still on, we feasted like kings. The wine flowed freely, the local band let rip and we were all soon enjoying dancing with the local beauties of Espéraza. Next day there was no race, just the evening train back to Paris. This time we had set ourselves up for a comfortable journey with seats. We slumped back exhausted from racing and feasting to sleep our way back to Paris. In the wee hours of the morning one of the lads woke us up. “We’re not moving, and it is really quiet!” A quick reconnoitre revealed that we had been shunted up a railway siding. We were now a few silent carriages without an engine. It’s common practice in Europe to divide trains up somewhere along their journey to send sections in different directions. A basic rule of travel is to check that out at departure. At dawn some French railway workers discovered us. When they finally recovered from their uncontrollable laughter they lead us back up the tracks to a station where we eventually connected with a Paris express. Our train pulled into the Austerlitz station and from there we had to trek across Paris to the Gare du Nord to link up with the train back to Ghent. We piled out of the Austerlitz station and spilled onto the huge cobbled forecourt about the size of two football pitches. People were lined up politely waiting for taxis. Time was short and we did not know the way so I and a couple of others went to the far end of the area and tried to grab a taxi on the way in. Out of nowhere this huge Gendarme (policeman) confronted us and ordered us back to the line-up. Time to play the Rainbow Jersey card. “Mon dieu! Monsieur Webb, Championat du monde” (Graham’s picture had been all over the papers and he was very recognisable). With that our Gendarme went off and commandeered two taxis! Meanwhile the bemused folks in the long taxi lines tuned in and all of a sudden we were signing autographs everywhere. The taxis arrived; we threw in our bags, hopped on our bikes and got motor paced at high speed through the hectic Parisian traffic to our destination. Our taxi drivers had the time of their lives leading this crazy procession of cycling celebrities across the City of Lights. And so for a little while longer our very own World Champion helped a bunch of modest racing cyclists experience the magic of the Rainbow Jersey and to race with the world’s best. At the 1967 World Road Race Championship Graham Webb was completely unknown so when he slipped off of the front they let him go. Being in Holland and not a hill in sight, Graham turned on the afterburners and TT’d to victory. That was the last time the elite peloton let him go out on his own. In fact I don’t think that he ever won a major road race again. Graham was a classic English time triallist. Strong as an ox but not up to handling rapid accelerations and fluctuating tempo’s. Britain never recognised Webb’s achievement but in his adopted home of Belgium he was recognised publicly by the King and a special commemorative postage stamp was issued in his honor! I roomed with him a couple of times and discovered that he was obsessed with keeping his muscles warm. Even in bed he wore his thick all wool track suit that covered him from neck to toe. On his head he wore a black woollen balaclava head piece that completely covered his head and had just two eye holes and a slit for the mouth. Waking up in the middle of the night and seeing that sight gave you a real start. How he wore this garb in the summer months I will never know. When Graham retired from racing I believe that he stayed in Belgium, married a local and became the proprietor of a typical Belgian French Fry stand which he runs to this day. The World Championships, the Grand Tours and the major classics provide those riders who either win them or perform well in them with lucrative invitations to local races all over Europe. These ‘names’ provide star attraction for the race organisers who in their turn make their money from the crowds who pay to see the events. These local races are the the back-bone of our sport and for many generations of racers they have enabled the stars to generously pad their bank accounts. I was fortunate to witness all these things first hand at many races just like the Grand Prix d'Espéraza.